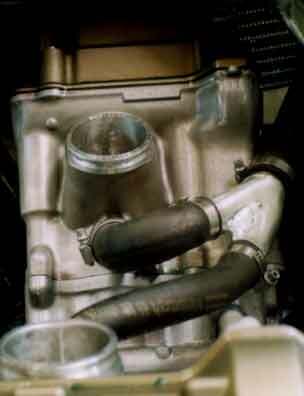 Honda's probably best kept secret:why they did they mount the Rads L+R.Can anybody re-enact? must we? Nevertheless,if you're often on track,or bend to sudden excursions into Nature,it's cheeper i guess installing the Rads in Front as HRC. Better Air flow too. I made some drafts for upper and lower Rad,now some Prototypes are ready,made by a Specialist in Germany. But you've to cut ~ 4,5 cm of the front head Cover,seal it with Epoxy-glue and a Alloy plate,no Problem,locate the Oil-Cooler right side. Something new also here:guess end of December i'll get a 2nd Prototyope upper+lower Rad Kit for fixing last shape. New Water Conducts:Thermostat/Emission Control Valve and Lines removed.